To say we love Girl Scout Cookies is an understatement, however cookie season seems to pass by in the blink of an eye, and we often miss our chance to snag a box or eight. 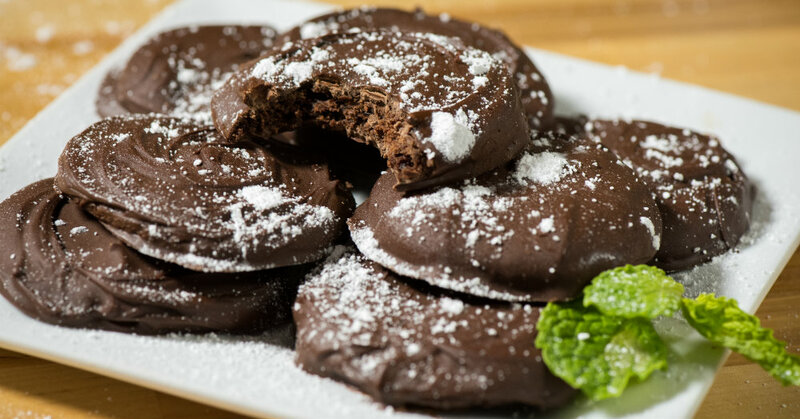 Luckily, we’ve developed our homemade version of Thin Mints so we can enjoy them all year long! These delightful chocolatey cookies are not only delicious but fun and easy to whip up. We love to make them with our kids and you will too! Cream together butter and sugar in a large bowl or mixer for 2-3 minutes, or until fluffy and lightened in color. Add in cocoa powder, vanilla and salt and mix until combined, scraping down the sides as you go. Divide dough into 3 equal sections, then roll them each into a disc and wrap tightly in plastic wrap. Refrigerate 15-20 minutes, or until chilled. Preheat your oven to 350º F and place one dough disc between two sheets of parchment paper. Roll dough out to 1/4-inch thickness. Use a 2-inch circle cookie cutter to cut out your cookies, then remove excess dough and transfer parchment paper to baking sheet. Place baking sheet in oven and bake for 8-9 minutes, or until crisp. Remove cookies from oven and let cool completely. Set up a double-boiler with a heat-proof bowl set over a pot of simmering water. Add chocolates and stir until melted and smooth, then stir in desired amount peppermint extract. Take cooled cookie and submerge it in melted chocolate. Use a fork to extract the cookie, tapping off excess chocolate, then transfer to a parchment-lined baking sheet to set. Repeat with remaining cookies, then refrigerate 4-8 hours, or until chocolate coating is set.